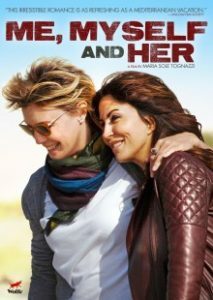 Billed as the first lesbian feature film from Italy, Me, Myself and Her directed by Maria Sole Tognazzi begs the question, “What took you so long Italy?” The film stars Sabrina Ferilli as Marina, a confident and beautiful woman in her 50’s. Her lover of five years is played by Margherita Buy as Frederica. You see, Frederica left a man, OMG, to be with Marina. She runs into a former “man of interest”. Does she want Marina or does she want to find out if she should be with a man. Keep reading the review because even though you are thinking that you’ve seen this one before, you haven’t. Watching any film with subtitles has always been tough for me. I feel like I miss something in those few seconds glances to the bottom of the screen. Not this time. Not this time because the words are guides but the depth and breadth of this relationship study is in the actions of the two main characters. Is Frederica’s son glad his mother is ready to be back with a guy? Does the journalist interviewing Marina hit the “coming out question” spot on? So few movies tackle a love story between lesbians over fifty. I don’t know if filmmakers believe that women getting close to receiving AARP mailings and Medicare flyers are not enticing subjects. Guess what, we are. We love, we ache, we giggle, we’ve become great lovers, and some of us learned to cook. We know what a good wine is and we’ve searched a long time for the spots on a lover’s body that carries them to that out of body world. And we’ve found them. Relationship questioning is not new to us either. We have jus had a bit more experience. There are a myriad of reasons to watch Me, Myself and Her. For me it was the draw of an Italian film. Oh how I love Italy. Then once the scene opened on these interesting women (not to mention lovely on the ol’ eye), the story became a lesson in love and truth and all of those things that make us decide that the relationship we question is the one that will last a lifetime. We hope. I haven’t reviewed a film for a while for EPOCHALIPS because I haven’t watched too many that captured me. This one did and if you are interested in something that is simple on the surface but will shoot to your core, rent it or buy it. Find that bottle of wine you love and then watch it alone first. Then, watch it again with a friend or lover. Oh and I don’t buy DVD’s often either, but this one made me change my mind on that too. (It’s available at Wolfe Video).